We've teamed up with Harringtons and Ben Fogle for the launch of their new campaign Walkies on the Wild Side. 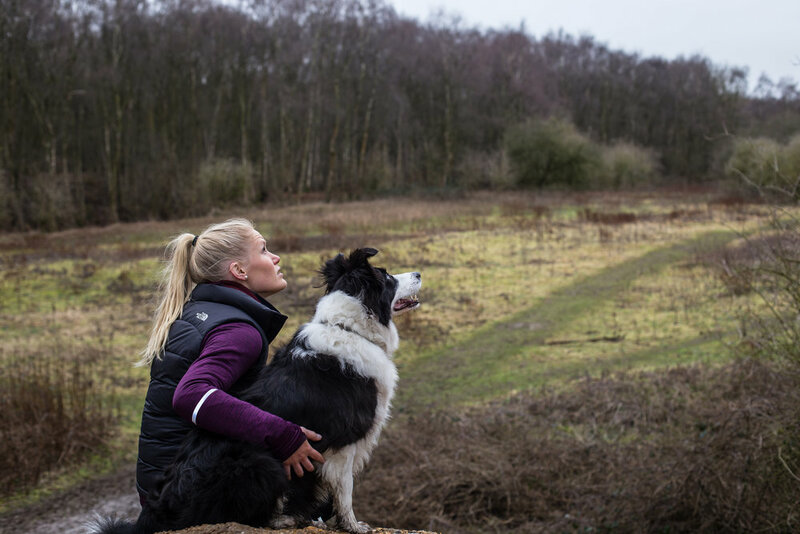 We were asked to share how we turn a regular dog walk into an adventure - a dogventure - and whether we have any tips for keeping fit on the way. 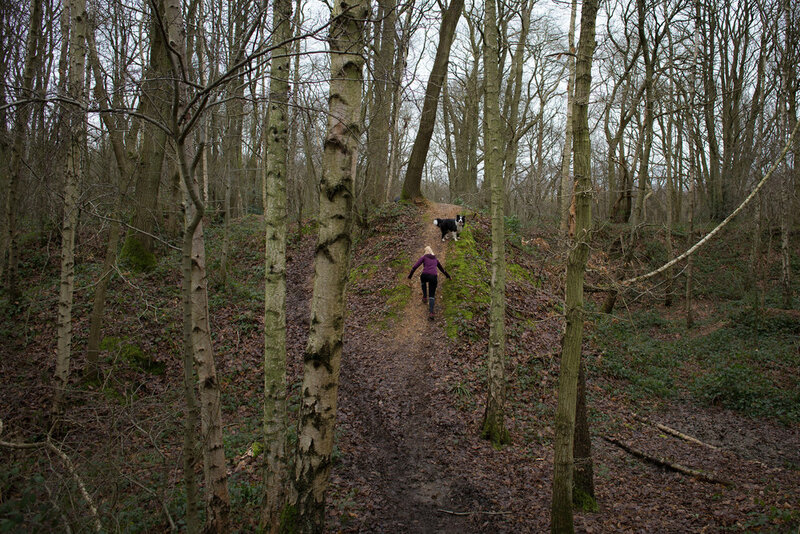 Our Dogventure takes place in Mardley Heath Nature Reserve, which is about 25 miles north of London not far from the A1. There's a free car park right in the middle of the Reserve so after parking up and getting your four-legged friend ready. Cross over the road and head into the Reserve, you should see a big wooden sign. The best thing about the walk is that you can explore it over and over again taking different forks and alternative paths and see different things. You can walk all the way around the perimeter but we tend to walk in and head read after a few metres which takes you down a little path to a lake. Straight away you're in the depths of the woods, its quiet and tranquil with nature happening all around. You could probably spend half a day exploring if you've never been before but Gatsby and I like to spend about an hour which allows us to see a good amount, you may want to allow 90 minutes to stop and check out the plants and wildlife. Gatsby snacking on Harringtons training treats - thanks Harringtons for sending these for G! As you head around each turn along the route you'll be confronted with something new. Keep an eye out for small ponds, wildlife and different plant species. The route is gently undulating but there are hills which you can use to turn a gentle walk into something a little bit harder for you and your dog. 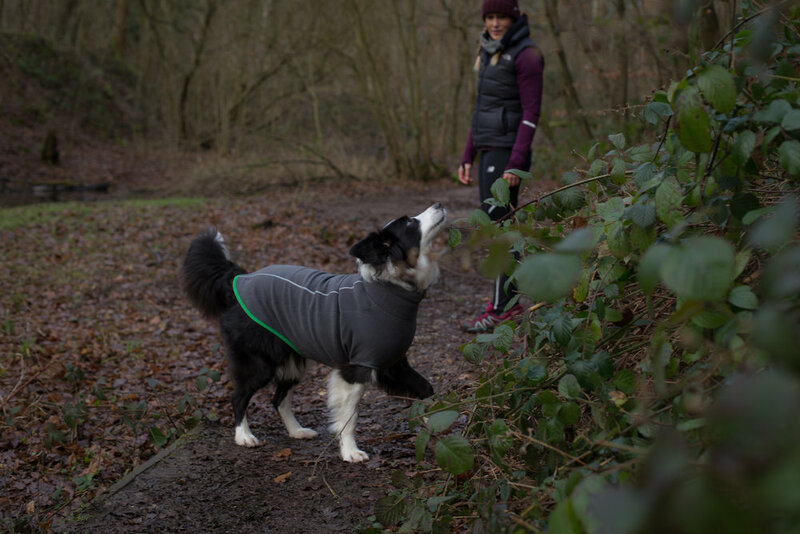 You can utilise the hills to change the intensity of your walk, if you're trying to improve the health of you and your dog you could try a brisk walk up the hills or even jogging or sprinting. 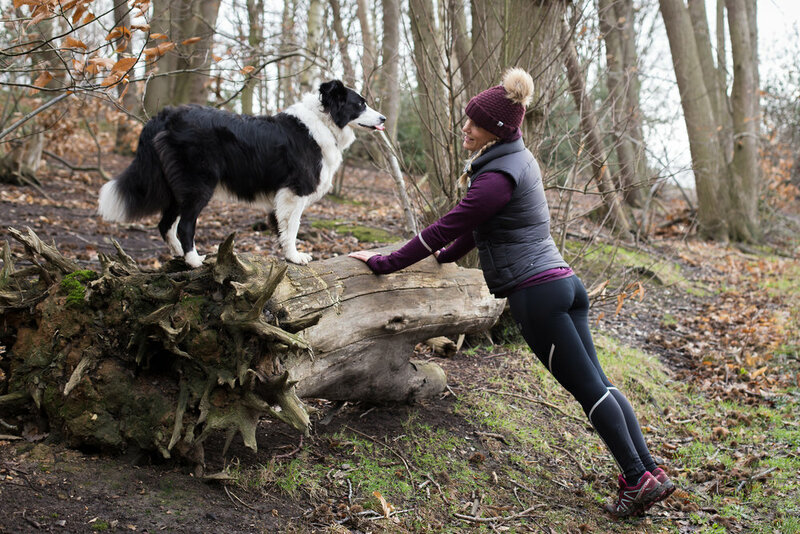 If you're new to working out be sure to see your GP before beginning a new exercise programme and similarly do check with your vet if you are unsure how to increase the intensity of your dog’s exercise. The route mostly follows trails and it's safest to stick on the well-walked paths. 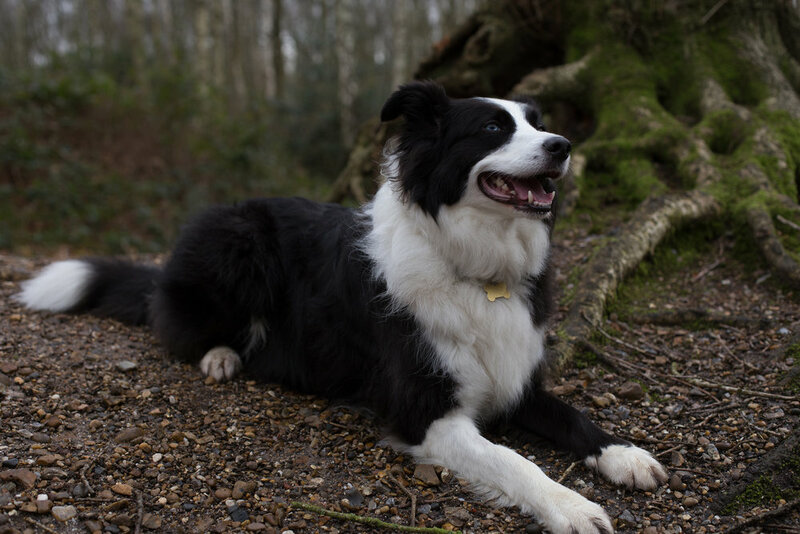 One reason why this walk is perfect for a Dogventure is because apart from woodland wildlife there is no other livestock so your dog can largely stay off the lead so they get to run and explore and find new smells and plants. 1. The changes in the plant life and woodland in the Nature Reserve. The walk is relatively flat but there are some hills and the Mardley trails add something a little bit different if you want to challenge yourself. The great thing here is that you can create an incredible interval training session without too much planning. The hills and trails provide natural challenges. 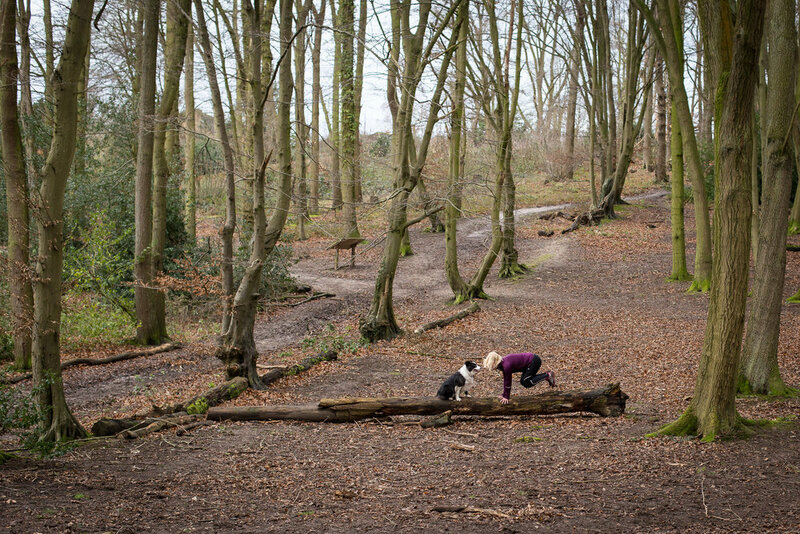 Being outside is the perfect way to utilise what nature has to offer and train using nature's gym. 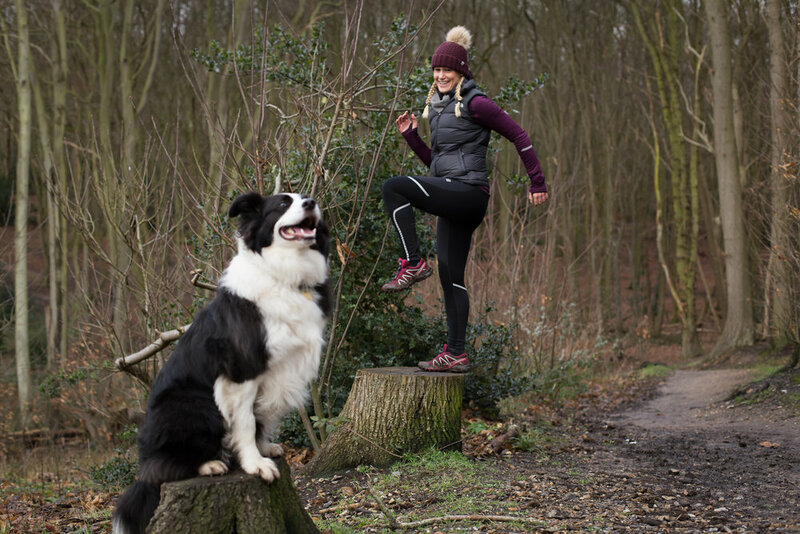 Keep your eyes peeled for things to step on or jump over such as tree stumps or logs - always remember to trial them for stability before jumping on them. I tend to keep my exercises pretty relaxed depending on how interested G is. Try and do 10 of each exercise before moving on. Whilst I do the exercises I either get G to join in and jump up to. Or I get him to sit or lie down. Sometimes I throw him a ball and try and fit in as many repetitions of an exercise as possible before he comes back. One other thing that works really well is to add little burst of running in too. Try running as fast as you can to the next tree or up a hill. I often race G too to keep him interested and focussed, he really loves racing. Thank you so much to Amy for joining G me and G and capturing all of these pictures. Check out Amy's work here. Finally as part of the campaign I answered a little Q&A for Harringtons. I love a good Q&A so thought I would share it here too. What’s your dog’s name, age and breed? Gatsby is 6 and he is a border collie. How long have you owned your dog for? I rescued Gatsby when he was 2 years old and have now owned him for almost 4 years. What are your dog’s likes and dislikes? Gatsby loves playing hide and seek either with me or with toys or treats. He really loves going out running and on adventures, you can follow his adventures on Instagram #GatsbyTheAdventurePup. Gatsby does not like fireworks or swimming. What are your dog’s favourite type of walks? Gatsby loves the mountains. He has a little adventure harness and a light and really likes exploring new places. Gatsby is a little bit frightened of water but enjoys playing on the beach and is now brave enough to paddle in the sea. Gatsby's favourite walks are first thing in the morning as he is often the first dog out to explore new smells and plants. Tell us a humorous dog walking story of your dog. When I first rescued Gatsby we lived in London. We used to walk around the local park and Gatsby would bark at the squirrels up in the trees. It always seemed like he was asking them to come down and play. We moved out of London 18 months ago and started walking in the countryside. Gatsby saw some squirrels in the local Nature Reserve. They ran up the tree and he barked. To Gatsby's surprise, they shouted back! Gatsby's face was a picture, he was wild eyed and so excited as he heard the squirrels chattering back at him from up in the trees. I really hope you like this walk. You can find it here on the Harrington's website. And why not check out some of the other walks for inspiration too, there are seven other walks including Ben Fogle's walk - read those here. Let me know your favourite dog walks and how you turn a walk into an adventure.